Yes, it's past mid-June and we're still planting the garden. This weekend I finally got the corn planted. Not the popcorn, mind you, but regular sweet corn (heirloom, of course). 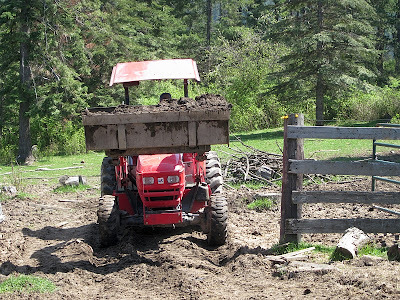 We decided to plant it in the corral behind the barn, which is deep soil full of composted manure since the animals spend a lot of time there in the winter. We can shut gates and keep the beasties out, and it has the added advantage of being virtually weed-free. But first it had to be prepped. Back in mid-May, when we still had the loan of our friend's tractor, Don hooked up our subsoiler and did some deep digging in the corral to churn up the soil. 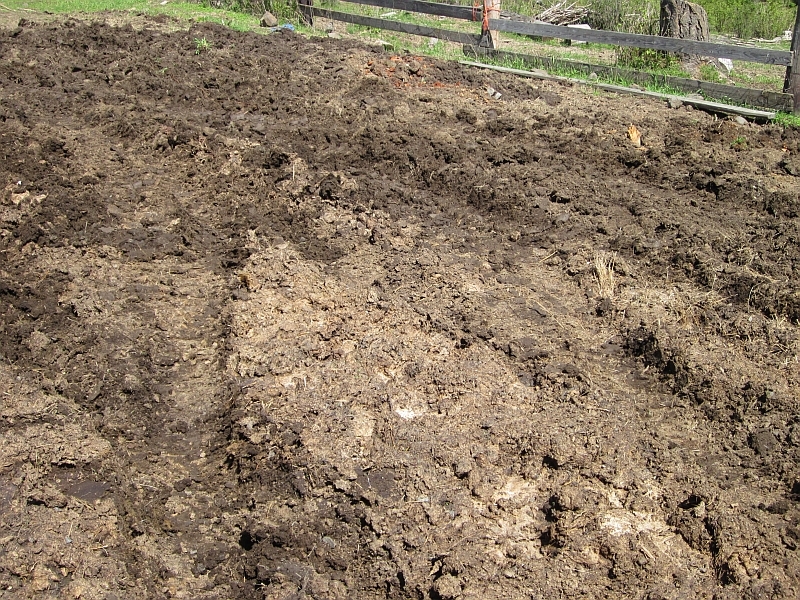 He also brought in extra buckets-ful of composted manure, to work into areas which were a little thin. ...but the other was so rotten it fell apart, so we sort of bulldozed it out. After he added a whole bunch of manure, we hooked up the cultivator and he tried to cultivate the corral. 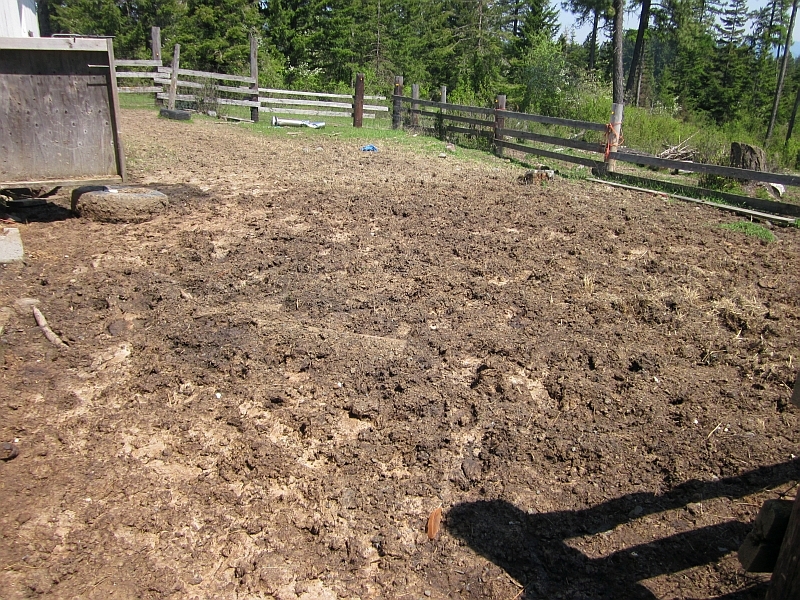 ...so we put the whole project on hold for a few weeks until things dried out. Fast-forward to this past weekend. The kids were with their grandparents in Coeur d'Alene, and Don was out of town at a selling even. With a few rare days at home alone, I decided to concentrate on planting corn and otherwise working on the tire garden. I started by soaking the seed corn in water for a few hours, to speed up germination. 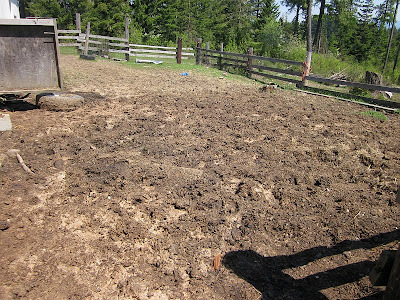 Suddenly the corral seemed like a huge space, faced with the possibility of planting it all by myself. But I set myself a goal to plant at least three rows at a time before taking a break to straighten up my aching back (from bending over). 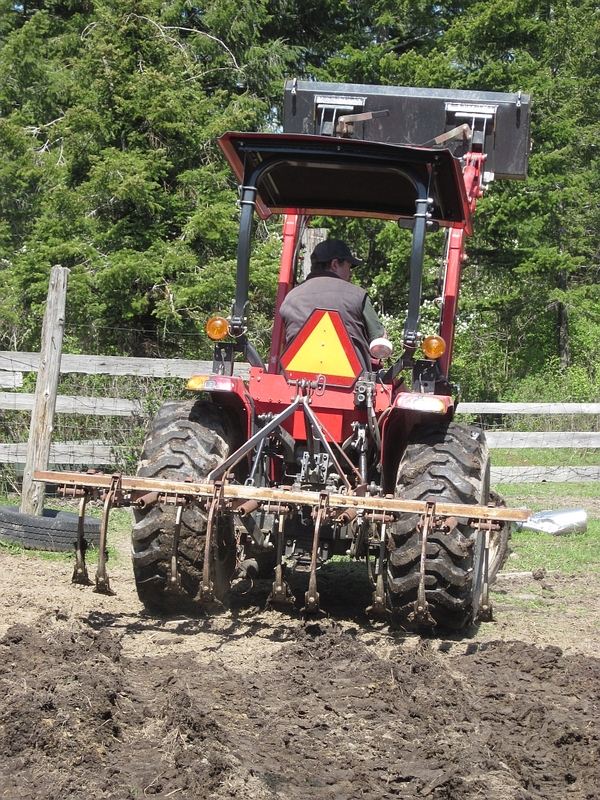 Each row was 20 feet long, so that's 60 linear feet of planted corn at a time. This pretty butterfly hovered nearby for over an hour. The cows were curious too. "Whatcha doing? Can we help?" These ladies are always my boon companions whenever I do any barn work. Thankfully their little chicken brains didn't compute that yummy edible corn was just under the surface. After I'd used up all the new seed corn I'd purchased, I took out the corn I'd saved from last year's (pathetic) crop. Little by little over the entire weekend, I planted corn until I had a section about 20x25 feet planted. Now we'll play the waiting game and see how much of it grows. One of the reasons we're interested in planting this much corn is to feed the chickens as well as ourselves. Chickens love corn, and cracked corn mixed with wheat would make an excellent feed for them. It's been a long-term goal to grow our own chicken seed, so we'll see what this year brings. Good luck with the corn this year. 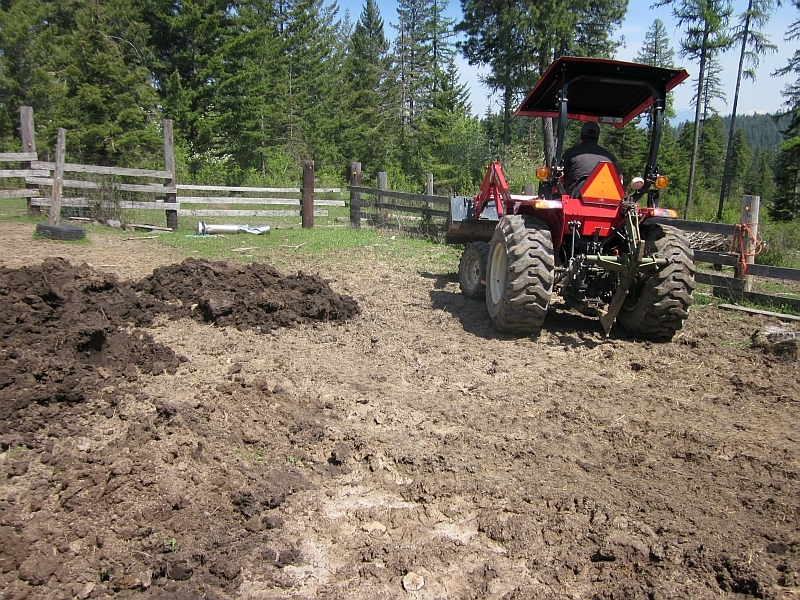 It's crazy the way we're still planting the third week of June here in North Idaho! Maybe this week we'll finally get the sun and warm soil our gardens need. Good luck with your corn. Will you be planting beans and some sort of squash or squash, pumpkin or cucumber with it? Thanks for the soaking tip, too. I would never have thought of that. As soon as the 90-degree weather breaks here, I'm going out and get to work on the new wheat, corn, squash and bean fields for next year. While I'm at it, gotta plant new apple and cherry trees...prepare a new bigger strawberry patch...install new fences...and transplant some blueberry bushes to a more hospitable site. I know you already planted your corn, but I thought this might be of interest. I just ran across it today and thought of you. Pellagra is a vitamin deficiency disease most commonly caused by a chronic lack of niacin (vitamin B3) in the diet. The traditional food preparation method of corn (maize), nixtamalization, by native New World cultivators who had domesticated corn required treatment of the grain with lime, an alkali. The lime treatment now has been shown to make niacin nutritionally available and reduce the chance of developing pellagra. 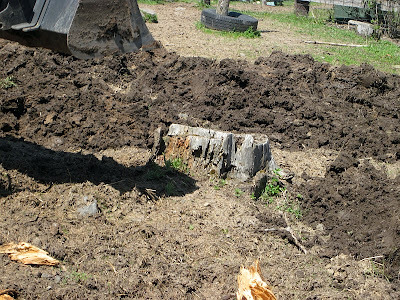 When corn cultivation was adopted worldwide, this preparation method was not accepted because the benefit was not understood. The original cultivators, often heavily dependent on corn, did not suffer from pellagra; it became common only when corn became a staple that was eaten without the traditional treatment. 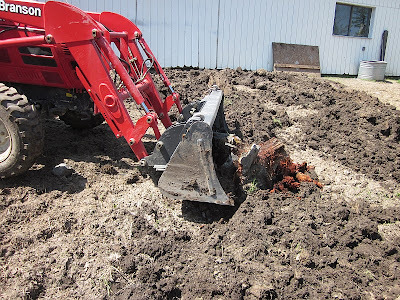 Apparently nixtamalization is not part of the planting process, but part of the hulling process. I planted 4 rows, 15 feet long with Yukon Chief corn (55 days) back on May 26. It has been covered with 10mil plastic and I lift it and water every few days as needed. At 6 days, the corn was sprouting and is now 6-8 inches tall. I just planted 7 more rows on 6/16 and have it covered with plastic. 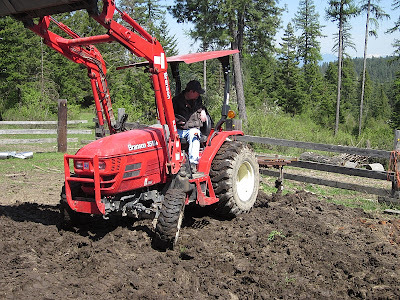 Once the weather warms, and stays that way, not a given here in North Idaho, I will uncover the first planting and let it grow up. I have raised bed and cattle panels covered with plastic for other things and some of my Glacier tomato plants have tomatoes on them. The Siberia and Moskvich have lots of flowers. We are in a "cold zone" but the plastic really helps. I plan on getting tires for sweet potatoes and just planted some short season watermelons that were developed just up the road from where I live. We had spinach from the garden last night, I pulled out the already bolted plants as the early bolters are not anything I would want to save seed from. It takes a lot of "babying" to get it done, but the fresh garden produce is so worth it. mollo, thanks for the info on corn and pellagra. hot dry and humidity is a killer in mississippi, but my tire garden is producing at this time very well. everything i have is in tires or pots buried deep and up to the rims in wood chips and pine straw. 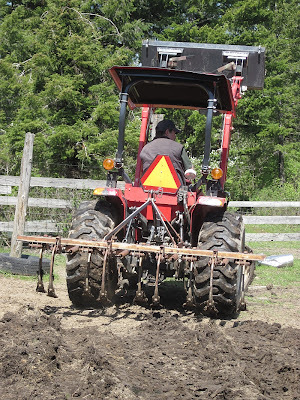 watering and fertilizing is a regular routine around here but what is more important is we have veggies galore and the promise of a busy summer and fall preserving and eating good. We're eating our sweet corn here. Squash, cucumbers, and beans are about over, and okra is fixin' to start. Corn planted in hot weather germinates MUCH quicker than corn planted in the early spring when the weather is cool to cold. I planted late this year, had a good rain after planting and within 3 day all the seeds had germinated. It was amazing.